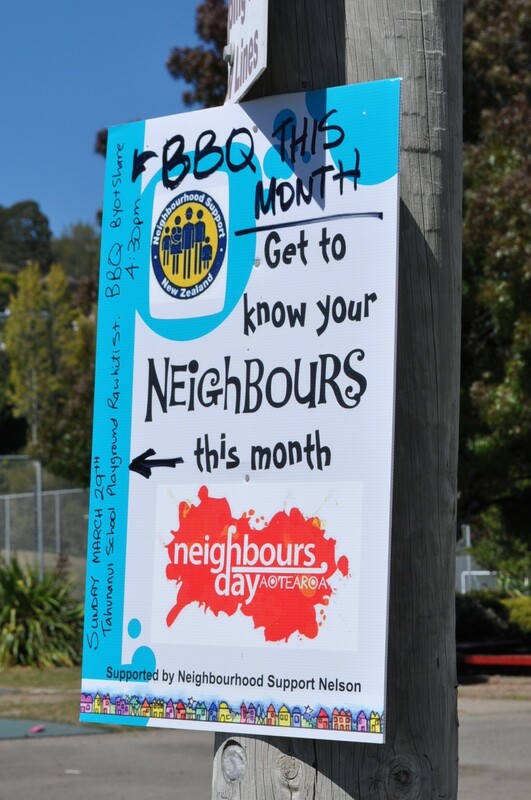 Nelson neighbourhoods have embraced Neighbours Day Aotearoa and organised all sorts of gatherings to celebrate the event on the last weekend of March.There will be BBQs, street parties, working bees, morning teas and dessert evenings over the course of the weekend. Neighbourhood Support Nelson has distributed 65 meat pack and bakery vouchers to neighbourhoods organising events and there are many other groups holding events as well. Participants include the Stoke Retirement Village, which is expecting 60 to 70 households in take part in their BBQ, and the Totara Grove Units in the Wood, which is expecting 40 households to take part in their gathering on their village green. There are many smaller gatherings planned as well, with groups of neighbours getting together in parks, streets and people’s backyards. Neighbourhood Support Nelson co-ordinator Karen Clark says it’s great to see so many neighbours entering into the spirit of Neighbours Day, which aims to bring neighbours together. “It’s an ideal opportunity to connect with neighbours and every connection helps turn neighbourhoods into safer, friendlier places to live,” she says. Karen says Neighbourhood Support Nelson is very grateful to the Nelson City Council and Network Tasman Trust for providing funding for the meat pack and bakery vouchers, and to Pestell’s butchery and Stoke Bakery for supplying the vouchers at a discount.